So begins The Pilgrim’s Guide, the world’s first guidebook. Written early in the twelfth century by Benedictine monks, it served travellers taking part in the great pilgrimage of the Middle Ages, to the tomb of the apostle St James, the cousin of Christ, at Santiago de Compostela in north-west Spain. The four roads are all in France: from Paris in the north; from Vézelay in Burgundy; from Le Puy-en-Velay in the Massif Central; and from Arles in Provence – all threading their way across the country before joining as a single road in northern Spain. 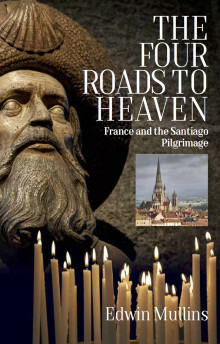 A step-by-step account of these four journeys through medieval France, the Guide’s aim was to explain to pilgrims the religious sites they would see on their way to Santiago, but it also offered advice on where to stay, what to eat and drink, and how to avoid dishonest innkeepers and murderous boatmen. Edwin Mullins follows the same four roads as they exist today in the footsteps of those medieval travellers. He explores the magnificent churches, abbeys and works of art which are the proud legacy of the pilgrimage, as well as reconstructing a turbulent period of history that encompassed wars, crusades and the Reconquest of Spain. Many of the buildings and landmarks that sprang up along the pilgrim routes still stand there today, and The Four Roads to Heaven brings to life their historical, architectural and spiritual significance. From imposing Romanesque and Gothic cathedrals to humble pilgrims’ hospices, this book looks at the living legacy of one of the great social phenomena of the Middle Ages – the pilgrimage to Santiago. Richly illustrated with Adam Woolfitt’s colour photographs, The Four Roads to Heaven offers an invaluable guide – nine hundred years after its predecessor – to the paths still trodden by increasing numbers of pilgrims. Edwin Mullins has written widely about the visual arts and particularly about French art and architecture. His many books include The Pilgrimage to Santiago, Avignon of the Popes, The Camargue, Roman Provence and the award-winning In Search of Cluny: God’s Lost Empire, all published by Signal Books. He is married with three grown-up children and five grandchildren. He lives and works in London.